Playing fetch, chew toys, belly rubs, walks in the park and chewing on sticks… These might be a few of your dog’s favorite things but have you ever truly explored the latter? There’s several reasons why dogs enjoy chewing on sticks but it probably isn’t the safest activity for your four-legged friend. Puppies enjoy chewing on anything they can find to help alleviate teething discomfort and although they might have an array of chew toys, they aren’t picky. 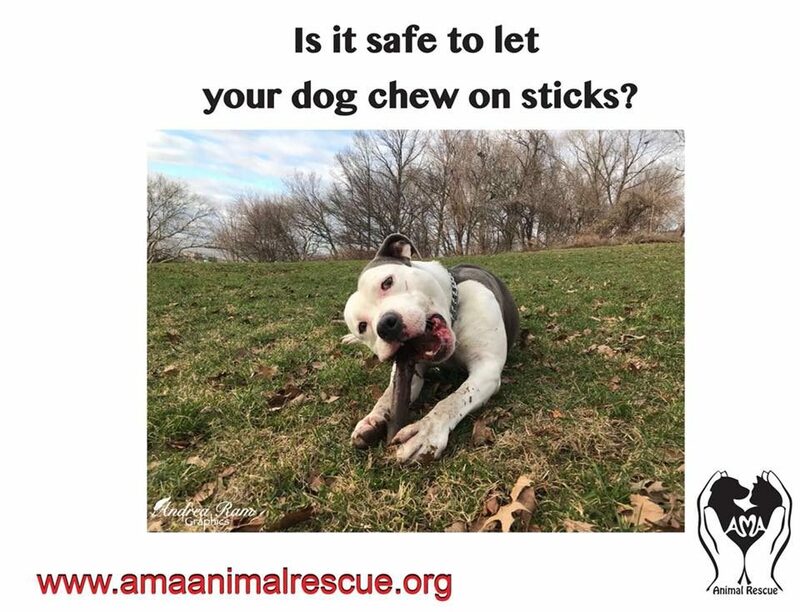 A stick might just be convenient enough since they are in a sense nature’s chew toy but allowing them to chew on it could create a bad habit. Furthermore, canines are foragers and even though they have become domesticated their nature has always played a part in their behavior. Dogs are also naturally curious, so a stick could seem very intriguing to Fluffy and since dogs explore by smell and taste it would be a natural instinct to gnaw on a stick. This habit or behavior could be very dangerous to your pet since it poses a few risks. The most obvious risk is that the stick could damage Fluffy’s gums, palate or tongue. Sharp edges could easily cause cuts and tears on the inside of a dog’s mouth but furthermore, there’s also a risk of splinters breaking off and getting lodged between teeth or inside his mouth. This could go unnoticed and develop into a costly and painful infection. Splinters that are swallowed could also cause damage by getting lodged in or cutting into the esophagus or intestines. In this case, surgery might become necessary in order to remove the splinter and repair the damage. Swallowing of wood pieces could also cause blockages within the intestines and could cause severe discomfort to your beloved canine. There are several training methods to break this habit. If your dog has an inclination to chewing on sticks, try to provide safer and more fun alternatives or activities. Take his favorite ball or toy with in walks in order to distract him from finding the nearest chewable stick. If distraction doesn’t work, try positive reinforcement when you tell your dog to ‘drop it’ or ‘leave it’. You might try practicing this at home with a stick, providing a treat when Fluffy leaves or drops the stick. Always award good behavior with a treat your dog loves in order to teach him right from wrong. And should your dog not respond to good behavior being rewarded, you could try to punish him for bad behavior. Saying no loudly and assertively or making a distracting noise when your dog picks up a stick could help him understand that it is not appropriate. Should none of these methods work and you find yourself still constantly battling to get Fluffy to stop chewing on sticks, there are preventive products you could try. A muzzle, cone or an Outfox field mask are all viable options to use to keep Fluffy from chewing on and eating objects that aren’t good for him. At the end of the day every pet parent makes their own decisions on what’s best for their pet, but staying informed as to the dangers and prevention methods of certain things is always the best way to make those decisions. So whether you let Fluffy chew on that stick or not, always make sure to know the risks! Is Your Puppy a Destructive Chewer?